Bathroom sink drain repair is one of the most common, and easiest do-it-yourself plumbing projects in the home. Whether you're clearing out a month's worth of hair and gunk from the drain or you're replacing the entire trap, repairing the drain in your bathroom sink is something even those with hardly any plumbing experience can do. Depending on when and how your house was built, your bathroom sink drains may consist of different pipe materials, like PVC or chrome-covered brass, but in essence, they all work the same. The drain consists of a straight piece of pipe that descends from the bottom the sink which is then connected to a straight piece of pipe that comes out of the wall. In between the two is a bent piece of pipe called a P-trap. When a wedding ring or something similarly small falls into the drain, it will normally remain in the P-trap because the item is usually too heavy for the draining water to lift out of the bottom of the bend. Because of this, in metal pipes, the P-trap can also rot out due to residue like minerals in the water that get left sitting along the bottom of the bend. Over time, this can cause the P-trap to start cracking and leaking. The bathroom sink is pretty much basic and straightforward. There are typically two problems that can cause it to need repaired - a leak or a clog. To make either of these repairs, you need is a pair of adjustable pliers and a roll of Teflon tape. If the P-trap is rotted away, you will need a replacement. Most home improvement stores sell bathroom sink drain repair kits that come with everything you need, except the pliers, for only around ten dollars. The vast majority of drain clogs are due to hair; this type of clog is very easy to clear without using harsh chemicals. Visit your local hardware store and in the plumbing section you'll find a long, thin flexible plastic tool that has multiple barbs along the sides. Just slide the tool down the drain and pull it back up. The barbs along the length of the tool grabs the hair and pulls is right up out of the drain. It may take a couple of times before you get it all out. Before you remove the P-trap, place an empty bucket below it because there will be water still inside the trap. Turn off the water supply lines so nobody accidentally uses the sink if you happen to step away for a minute. Use the adjustable pliers to loosen the nut located at the top of the P-trap. Use your hand to unscrew it the rest of the way. Use the pliers to loosen the nut that connects the P-trap to the pipe coming out of the wall next. Once it is freed all the way, detach the P-trap from the drain and pour the standing water left in the trap into the bucket below. Take the new P-trap and wrap two passes of Teflon tape around the threads on both ends. Connect the P-trap to the wall pipe by hand-tightening the nut over the threads. Line up the other end of the trap with the pipe from the sink and hand-tighten the nut on that side as well. Use the adjustable pliers to tighten the nuts, but try to avoid over-tightening or you may crack the nut or strip the threads on the trap. Turn the water supply lines back on and pull up the stopper rod so the plug is set in the sink. Turn on the faucet and fill the sink with water, then pull the plug and let the water drain. While the water is flowing through the drain pipes, check for any leaks, especially around the points where the P-trap meets the other pipes. 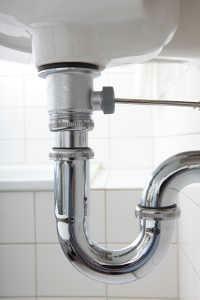 Most bathroom sink drain repairs should be carried out sooner than later. Don't wait until too much time has passed to clear a drain or replace an old trap, or you may be facing bigger problems.